A few days before July's half marathon, I had a brilliant job interview. Totally nailed it. The woman, who would be my direct superior, said she was impressed, and though she would be on vacation for two weeks, she'd contact me when she got back to schedule a second interview with the president of the school. I used those two weeks to read as many books as I could from the library on adolescent psychology, since she said my one weakness with the position was that my experience was with university students, and this position would be working with middle- and high-school age kids. The day she said she'd be back in the office, I waited by the phone. Nothing all day. I reached out to her the next morning, and received a very short response, saying she was still in the interview process and would contact me soon. That was last Monday. I finally heard from her Thursday morning, and scheduled a second interview for that very afternoon. The president was equally impressed - in fact, he stopped me in the middle of one of my responses to let me know that for someone who's only spent two weeks in France, your French is ... remarkable. Dramatic pause and everything. I walked out the door that day, certain this job was in the bag. I had gone in there, gave them everything I had, and they seemed to love it. They said I would receive a decision on Friday or Monday. Needless to say, my stressed-out neurotic self checked my e-mail approximately every two to three minutes all day Friday. Nothing, but not a big worry - maybe they were waiting to speak with some of my references. But then Monday came and went. Same routine, checking and rechecking my e-mail. Same nothingness. Not even a rejection letter, which makes it all harder - I'd honestly rather hear first thing in the morning that I was rejected than wait all day for an acceptance that never comes. Monday night, I binged. I hadn't eaten most of the day - stomach in a nervous knot - but I certainly made up for it once 5 p.m. hit. After a brief teary conversation with my siblings (my little brother, the eternal optimist, said to cheer up, that I am still a good person even if they don't hire me), I was torn about what to do. If I leave the apartment, I'll binge. If I stay home, I'll likely overeat, but the damage would be controlled. Driven by a need to feel comforted, even if it was in an unhealthy way, I decided to leave. In the morning, Matt held me as I cried. He said there was still a little hope - he'd once received a job offer long after the promised date - and he insisted I e-mail the woman, if only to get a definitive no/why not. I e-mailed her, applied for a half dozen jobs, and then went out. Matt had come home that morning with cans of soup (he's fighting a cold now, like I had when I first got back from California) and I went to the grocery store to exchange them for a different variety. Instead of taking the bus, I walked. I figured, I have nothing else to do today, why not? I swapped the soups, then walked to a thrift store nearby to see if they had any of the vintage Pyrex I love (they didn't). And then, I remembered what else was near there: a French pastry shop. The anticipatory wave of excitement rushed over me, and I headed to the bank to transfer some money from my savings to my checking account - these lovely little French cookies are labor-intensive to make, and thus cost nearly $2 a piece. After transferring the money and walking out the door of the bank, though, the feeling in my body changed. It hit me: if I binge right now, it isn't going to be enough. After two to three weeks of nearly daily binges, my tolerance level is elevated. I crave the numbness even more than the macarons, and at this point, it's going to take a lot to achieve that high. I stood on the sidewalk, unable to move, and then, I heard my phone buzz. An e-mail. From the woman at the school. It floored me. I thought I had gone in there shining, close to flawless. She's not a native speaker, and given the context of the rest of the e-mail, I don't think "self-confidence" is the right word for what she's trying to say. But that doesn't mean it isn't true, and hearing it hit me like a ton of bricks. My confidence is shot right now. This job would have been incredible, but instead, the search continues. I not only failed at my goal to run a marathon, but there's a monetary loss as well - equal to a month of groceries, or almost half a month's rent. And I'm now not only unable to say I've lost 150 pounds, but on the cusp of unable to say 140. My clothes are all feeling snug, since I got rid of anything bigger than a medium when I left California in an attempt to (a) save space in my suitcases and (b) prevent a regain. I'm uncomfortable in my own skin. I just didn't think anyone else could notice. Funny, though: I thought the same at rock bottom. Feeling out of control is terrible. Slipping, falling, and unsure of how to get back on your feet - it's tough. And it's even more difficult when you're fiercely independent and want to be wholly responsible for everything you accomplish, good or bad. There's nothing wrong, though, with needing a helping hand. It's not a failure. It says nothing about a lack of strength. In fact, it's the opposite. There's no weakness in asking for a life preserver instead of resisting help and drowning. I didn't walk to the pastry shop. I walked in the other direction, and I stumbled upon a small storefront in a plaza I'd never seen before. I wandered in, asked a few questions, got a ton of answers, and then handed over my credit card. 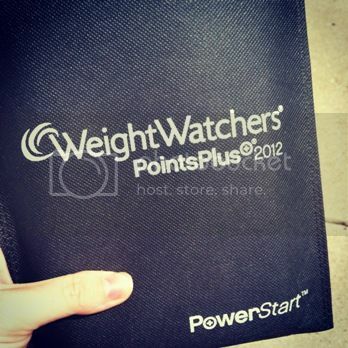 I'll be hashing out some of my thoughts on Weight Watchers in a later post, either tomorrow or in a few days. I have more than my share of reservations. But I also know from the blogging community that if you stick to the plan, if you wholeheartedly commit to it, it works. I'm going to give this a fair and honest try for one month - there's no contract, so if it isn't right for me, I can move on to whatever my next option may be. I lost 150 pounds without counting calories, without food tracking, without meetings. But that was then, and this is now. Right now, I need a plan with rules and structure. I need support, and to build up my offline community. I want my confidence back, and this is step one in my journey back to my happy, healthy self.